Modeling and High Performance Control of Electric Machines introduces you to both the modeling and control of electric machines. The direct current (DC) machine and the alternating current (AC) machines (induction, PM synchronous, and BLDC) are all covered in detail. The author emphasizes control techniques used for high-performance applications, specifically ones that require both rapid and precise control of position, speed, or torque. You'll discover how to derive mathematical models of the machines, and how the resulting models can be used to design control algorithms that achieve high performance. 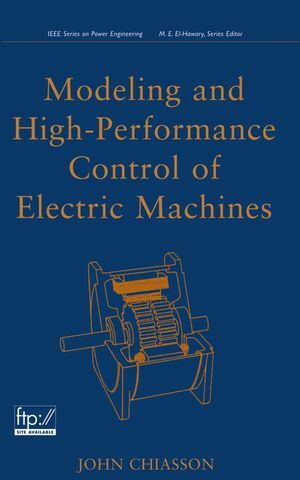 Graduate students studying power and control as well as practicing engineers in industry will find this a highly readable text on the operation, modeling, and control of electric machines. An Instructor Support FTP site is also available. JOHN CHIASSON, PhD, is on the faculty of the Department of Electrical and Computer Engineering at Boise State University in Boise Idaho. His research interests include the areas of power electronics and the control of electrical machines. PART I: DC MACHINES, CONTROLS AND MAGNETICS. 1. The Physics of the DC Motor. 3. Magnetic Fields and Materials. PART II: AC MACHINE THEORY. 5. The Physics of AC Machines. 6. Mathematical Models of AC Machines. 7. Symmetric Balanced Three-Phase AC Machines. 9. PM Synchronous Motor Control. 10. Trapezoidal Back-Emf PM Synchronous Motors (BLDC). Appendix: Trigonometric Table and Identities.